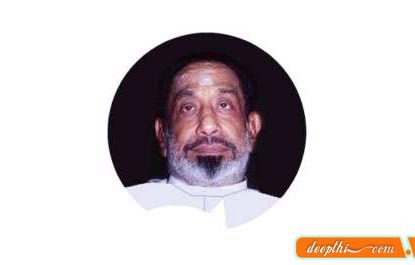 Sivaji Ganesan (October 1, 1927 - July 21, 2001) was a famous Indian actor and politician. His real name was Villupuram Chinnaiahpillai Ganesan. Ganesan was born in Sirkali, Thanjavur district, Tamil Nadu, India. His parents were P. Chinniah Mandraayer and Rajamani Ammal. Ganesan was married to Kamala (known also as Kamalammal). His two sons, Ramkumar and Prabhu carry on their father's legacy in filmmaking and acting. His two daughters are Shanthi and Thenmozhi. It should be noted that his grand daughter is married to the adopted son of J.Jayalalitha, once considered his political enemy. Suffering from respiratory problems, Ganesan was admitted to the Apollo Hospital in Madras on July 12, 2001. He also had been suffering from a prolonged heart ailment for about 10 years. He died at Apollo Hospital at 7:45pm (IST) on July 21, 2001. He was 74. At the age of 9, Ganeshan was so interested in stage plays that he ran away from home to pursue a career in theatre. His mother helped him get into a famous drama troupe. Ganesan's first film was Paraasakthi in the year 1952. He has acted in about 300 movies, including nine Telugu movies,one Kannada movie, two Malayalam movies and two Hindi movies. The name 'Sivaji' was given to him by Thanthai Periyar after watching his excellent stage performance as Emperor Shivaji. He is also known as Nadigar Thilagam, Nadippu Chakravarthy (loosely translated "Acting Emperor") and the Marlon Brando of Asian cinema. He was a major actor of his period in South Indian cinema.